Clearly iStamp: Clearly iStamp is moving! We have lots of new and exciting changes going on for you at Clear Dollar Stamps! The first one is that we are moving from this Typepad blog to a Blogger blog.....TODAY! We have an adorable new blog that Laurie Wilson created, full of bright colors and bright new ideas for the future! You will find wonderful tutorials, just like before, only at our new home! This blog will remain up as an archive of all of our past inspirations....and some we plan on moving over to the new blog! Either way, you are sure to be inspired to your full creativity! Clear Dollar Stamps has been a real blessing to my family and me for many years now. I fell in love with stamping about 8 years ago and have loved this craft and created stamps alongside many talented illustrators and artists ever since. I have loved each step of this path, and have prayed about each step I have taken. This past year, God called me to homeschool my girls. They were doing wonderful in public school, they were at the top of their classes, and each had their own set of friends with which they had bonded. However, God told me that it was time to pull them in to a learning environment where we could make God a daily...no hourly.....part of their learning and growing. It isn't very often that you have a complete peace wash over you and hear God saying, "I want you to do ________". This is what happened to me standing in the isles of an homeschool convention in May of 2011....what a glorious experience! This last fall we began homeschooling and have enjoyed every minute of it....no it hasn't be complete perfection and bliss, but being in God's will has. 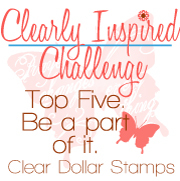 I have tried to juggle Clear Dollar Stamps and homeschooling for a year now, and I know that it can't be done.....well, can't be done well :-) I have always felt like Clear Dollar Stamps was my ministry by creating scripture stamps and art stamps that glorify God. I still feel this is my ministry, but it is going to have to take on a new face, at least for a while. As you have noticed, we have been producing more and more Digi Stamps and have not released any Clear Stamps since January of this year. Keeping up with the inventory, employees, shipping of physical stamps is just too much for a homeshooling mom....at this point. God has given me a peace about creating Clearly Digi Stamps (changing from Clear Dollar Stamps) and teaching each of you along the way how to use them and help you fall in love with Digis, just like I have! I am hoping in the future, I will be able to add some stamps back in the mix, but for now, I am going to enjoy my digi stamps! I hope you will continue to follow us on our creative journey and be a part of our Digi stamp family! wow lori! you are truly blessed! i know that "peaceful" feeling at hearing GOD'S voice in your heart and there's nothing better. i wish you many happy miracles and i'll be looking forward to your digis and hearing about how all is going. Hi Lori. I have been loving your stamps for several years now and have purchased some of your digis. I love your digital images and feel that they best suit me due to living on a budget. So to see that you are having a digi store only for a while really makes me feel blessed because your still in this big paper crafting world and your message of God's goodness is still attainable through your site. I want to extend to you a big cyber hug because I truly know where you are coming from with your decision to homeschool your children. Last year was also my first year to homeschool and we were also feeling God's call on us has parents to homeschool. It was a wonderful year filled with wonderful moments, but also challenges. Learning the ropes and finding knew and exciting ways to make each day count were extremely important. I will admit that a lot of days were difficult and it was through Christ strength, and it alone, that got me through. We are on board again this year and praying for His leading and learning in this new year of school. I will pray for you sweetie has I know how tough it can be but the eternal rewards are many. Thanks for being obedient in obey the voice of the Lord. Hugs. Just want to wish you the best with your family and with the new turn your business is taking. Listening to God is always the path we should follow. hello, i am new here and glad to be here!thank u for your sharing! Thank you so much for sharing Lori! I to know the wonderful blessing of being in God's will regarding homeschooling my children. I love digis to and am glad that you're continuing on sharing this wonderful ministry! I love your new blog and am looking forward to what you have to share in the future!